Amazon WorkSpaces is a fully managed, secure Desktop-as-a-Service (DaaS) solution that runs on AWS. AWS provides several choices to deploy desktops to users. Some organizations need help integrating this process into their existing automation and Information Technology Service Management (ITSM) tools. Many of the customers I talk to want to have an approval process and a tracking mechanism for their Amazon WorkSpaces process. 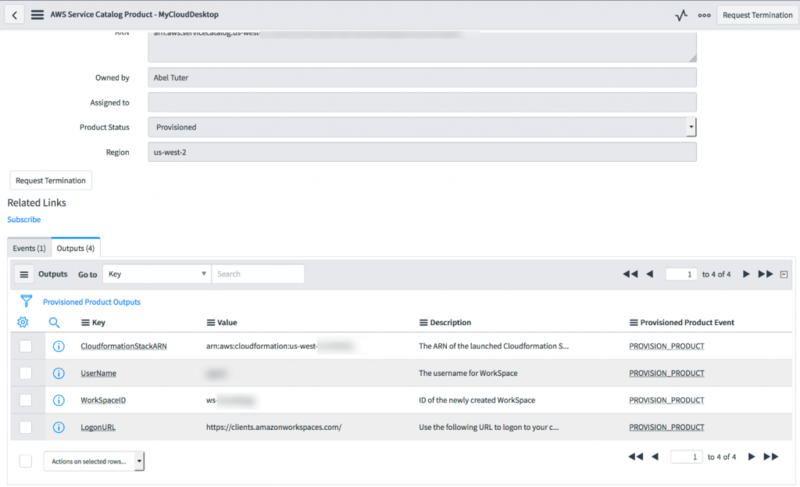 With the recent release of the AWS Service Catalog Connector for ServiceNow, this integration has become much easier. In this blog post, we will show you how to set up AWS Service Catalog to deploy Amazon WorkSpaces using the AWS Service Catalog Connector for ServiceNow. The following high-level architecture diagram shows core solution components. The following diagram summarizes end-user interactions. Diagram – flow showing AWS Service Catalog portfolios, API calls from ServiceNow and end user interactions. AWS Service Catalog allows you to centrally manage commonly deployed AWS services and provisioned software products. It helps your organization achieve consistent governance and compliance requirements, while enabling users to quickly deploy only the approved AWS services they need. ServiceNow is an enterprise service management platform that places a service-oriented lens on the activities, tasks, and processes that make up day-to-day work life to enable a modern work environment. Service Catalog is a self-service application that end users can use to order IT services based on request fulfillment approvals and workflows. To deploy this solution, ensure that you have completed the following prerequisites. Access to an enterprise or a ServiceNow Personal Developer (PDI) instance. Configure the AWS Service Catalog Connector for ServiceNow by following this blog. Amazon WorkSpaces requires the use of a directory to store and manage information for your WorkSpaces and users. See the Amazon Workspaces Administration Guide on Managing Directories for more information about directories. If you already have a directory (Simple AD, Microsoft AD, or AD Connector) deployed on AWS, you can skip this section. If not, you can follow the detailed steps from Appendix A to set up a directory that will be used to store user accounts for your WorkSpaces users. In this section, you will set up a CloudFormation template that deploys Amazon WorkSpaces on your behalf. You can learn more about this step in the AWS Service Catalog Administrators Guide. Open a text editor or your favorite code editor, copy the following text, and paste it into a new file. 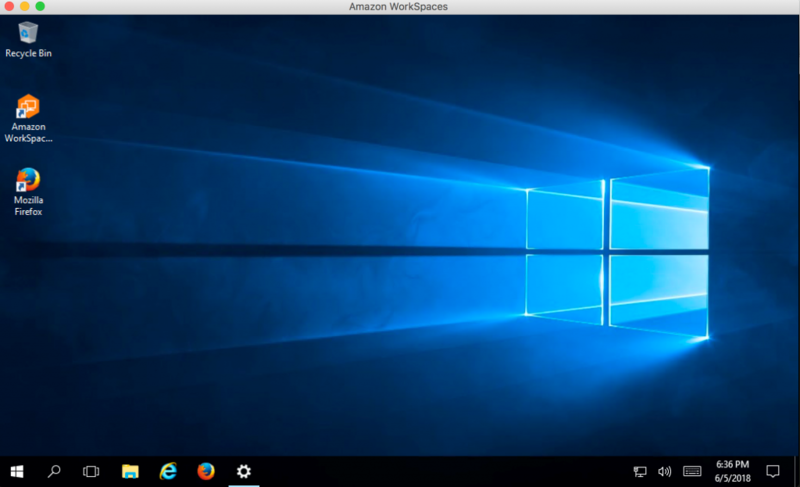 deploy a single Amazon WorkSpaces desktop. In the Mappings section of the CloudFormation template, locate the 3 occurrences of the text “d-XXXXXXXXXX” and replace all of these with the directory ID you captured when you set up the directory (Appendix A). Save the file on your computer as deploy-workspaces.template and note where you are saving it. To provide users with products, begin by creating a portfolio for those products. To create a portfolio, follow the detailed instructions in the AWS Service Catalog documentation. After you have created a portfolio, add a new product using detailed instructions in the AWS Service Catalog documentation. To enable AWS Service Catalog to launch Amazon WorkSpaces, you need to grant additional security privileges. You achieve that through additional AWS Identity and Access Management (IAM) permissions and a launch constraint. 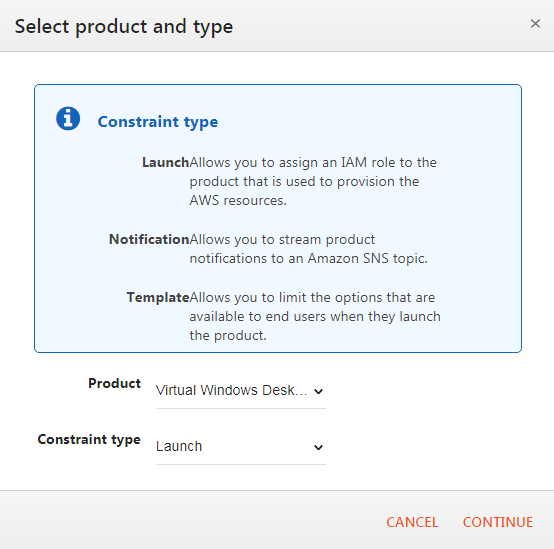 A launch constraint specifies the IAM role that AWS Service Catalog assumes when an end user launches a product. In this step, we will set up an IAM policy and modify an existing role. Make sure that you have followed the steps for integration prerequisites, discussed earlier, prior to starting this section. In this step you will create an IAM policy ‘SCWorkSpacesLaunchPermissions’ to match the following permissions. To create an IAM policy, follow the detailed instructions in the IAM User Guide. Modify the existing SCConnectLaunch role and attach the SCWorkSpacesLaunchPermissions policy to it. Refer to Appendix B for detailed instructions. A launch constraint specifies the IAM role that AWS Service Catalog assumes when an end user launches a product. For the new Virtual Windows Desktop product, assign the launch constraint- ‘SCConnectLaunch’ before it can be launched. Refer to Appendix C for detailed instructions. You are now ready to validate that the new product appears in ServiceNow, and that you can order a product through the ServiceNow Service Catalog. Log into your ServiceNow instance as the end user (e.g., Abel Tuter). If you are logged into a developer instance as the administrator, you can do this by choosing Impersonate User from the user menu in the upper-right corner of your screen. Type Service Catalog in the navigation filter and choose Service Catalog. WorkStationType – Choose your type of workstation, Value, Standard or Performance. If you modified your CloudFormation template to include different bundle names, they should appear here. UserName – Type the Windows user name that you specified when you created the user (Appendix A). If you are unable to provision a WorkSpace using the user ID you enter here, ask your Active Directory administrator for your SAMAccountName. Choose My Assets from the left menu to view your request. 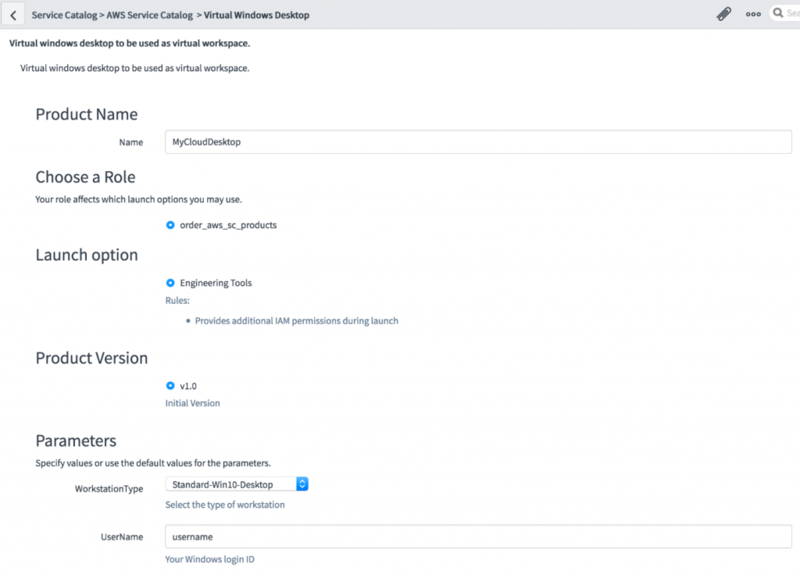 If you do not see the configuration item field on the my requested assets table, follow the steps in Appendix D.
To view the output parameters from the provisioned product, locate your request for a virtual windows desktop, and choose the ‘MyCloudDesktop’ configuration item link. These are the outputs from the AWS CloudFormation output parameters that you can use to start interacting with the cloud desktop. 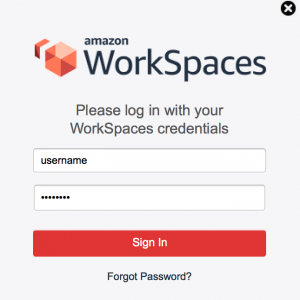 After Amazon WorkSpaces provisioning is complete, you should receive an email from AWS with complete instructions on how to complete your user profile and log in to your Amazon WorkSpace instance. Make sure you complete your user profile first. The following shows at a high level how you can log in to your WorkSpace after user profile completion. You start by downloading the WorkSpaces client for your platform. After you have installed the WorkSpaces client, log in by using your username and associated credentials. Optionally you can also log on to the AWS Management Console and validate the Amazon WorkSpace information. 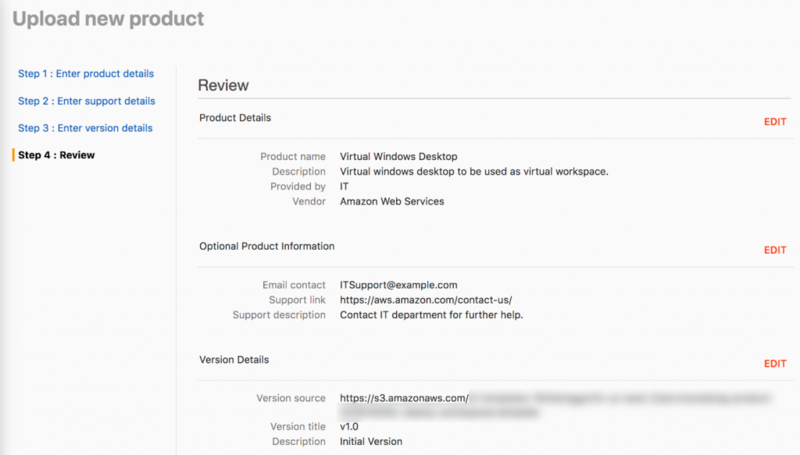 In this post, we covered how you can use AWS Service Catalog to create a fully automated, self-service cloud desktop solution for deploying Amazon WorkSpaces through ServiceNow. This allows your company to use its ServiceNow instance for workflows and for provisioning and tracking AWS resources. Centralized cloud management teams can use this approach to curate the battle-tested, best-practices based software-infrastructure blueprints, and offer those enterprise-wide for easy, self-service adoption as Service Catalog products. 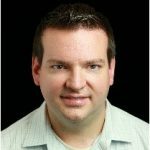 Joe Wozniak is a New York-based Cloud Infrastructure Architect for AWS Professional Services. Joe enjoys helping customers design and implement automation solutions to make their lives easier. In his free time, Joe enjoys going to movies, skiing, tinkering with electronics and spending time with his family. 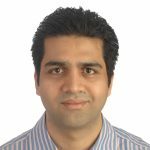 Sanjay Garje is a San Francisco-based Sr. Technical Business Development Manager for AWS Service Catalog. Sanjay is a passionate technologist who takes pride in helping customers on their AWS Cloud journeys by showing them how to transform their business and technology outcomes. In his free time, Sanjay enjoys running, learning new things, teaching cloud technologies and travelling to new destinations with his family. In the context of testing or proof-of-concept work, we recommend that you deploy Simple AD if you don’t already have a directory setup. Simple AD is a cost-effective solution to get your environment ready for deploying Amazon WorkSpaces quickly. To create a Simple AD directory, follow the steps in Create a Simple AD Directory. Before you can use ServiceNow to deploy WorkSpaces, you need to set up user accounts in the directory for the people for which you will create WorkSpaces. NOTE: If you have AD Connector set up, users would already exist in your directory, allowing you to skip this step. Open the Amazon WorkSpaces console. Make sure the correct Region is selected in the upper right of the console. Select your directory from the list and choose Next Step. Type the Username, First Name, Last Name and valid email address for the first user you want to add. NOTE: If you do not specify a valid email address, the user will not be able to log in. If you want to add more than just one user, choose + Create Additional Users. This will add more rows to the form. Choose Cancel at the bottom of the form. We do not actually want to allocate Amazon WorkSpaces to these users at this time, just create the accounts. Each directory you set up will be provisioned with a unique directory ID. It is necessary to acquire at least one of these directory IDs from your Amazon WorkSpaces deployment. This is needed in the next section and is used to tell your CloudFormation template under which directory to deploy WorkSpaces. In the left navigation panel, choose Directories. Check the box next to the directory you want, then highlight the text of the Directory ID (d-XXXXXXXXXX) to copy it to your clipboard. Paste this ID somewhere where you can get back to it easily for a later step. Open the IAM console roles page. Locate the SCConnectLaunch role in the list or type the name in the search box and then choose the role in the Role name column. In the search box, begin typing SCWorkSpacesLaunchPermissions to locate the policy. 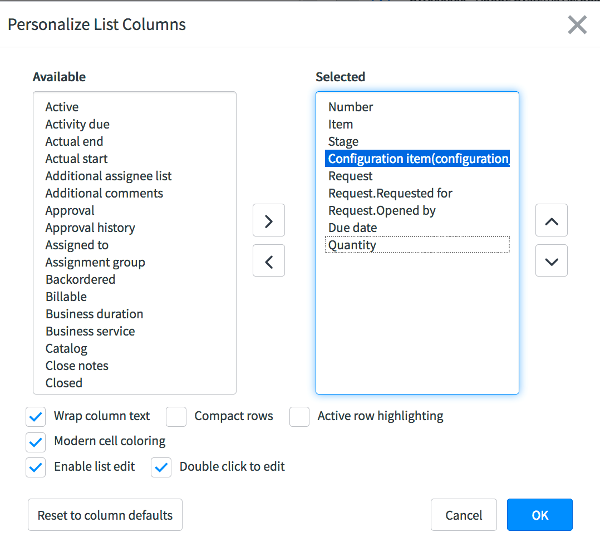 Select the checkbox in the first column to assign that policy. On the role summary screen, choose the copy icon next to the Role ARN field. This will copy the ARN to your clipboard. Paste the ARN somewhere for safekeeping (e.g., Notepad). You will need it in the next section. Open the AWS Service Catalog console. Open the End-User-Compute portfolio we previously created. Choose the ADD CONSTRAINTS link. You should see the following dialog box. You will be prompted for the IAM role and description. IAM role – There are two boxes, paste the SCConnectLaunch role ARN that you set up in Appendix B into the second box. Choose the Settings cogwheel in the header row of the table of asset requests. This step allows the ‘configuration item’ tab to be displayed in the ‘My Asset Requests’ table.